Plastics in the ocean end up in the stomach – Jesenia De Moya C.
Commonwealth Scientific and Industrial Research Organization, together with Imperial College London, looked at published studies since the early 1960’s and found that the number of seabirds –including albatrosses and penguins– that have ingested plastic has increased significantly since 1980. 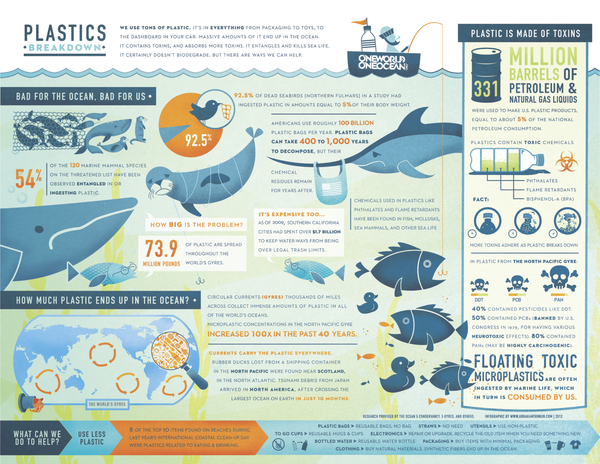 They estimate in their own that 90% of all living seabirds today have plastic in their stomach. Created by One Ocean One World. What about those in the ocean? In February, Science published a study that evidenced the known. But we didn’t image it was that bad: In 2010, eight million tons of plastic trash ended up in the ocean. No only do sea turtles eat grocery plastics bags for jellyfish, but corals -animals which produce 50% of the world’s oxygen- are actively ingesting microplastics from your cosmetics packaging and your car’s dashboard cover. In a chain of thoughts, Archives of Environmental Contamination and Toxicology found that zooplankton is feeding on microplastics believing it is its regular meal, and which is the primary food source for corals around the globe. When fish -like the parrot fish- feed on these polluted corals, which eat polluted bacteria and plankton, caught and served as your meal, it means humans are also ingesting plastics. You let me know if there is enough Food for Thought here. What would you do today and on to reduce ocean pollution driven by plastics?